An amazing watch both in look and design. Runs forever on the power of sunlight. 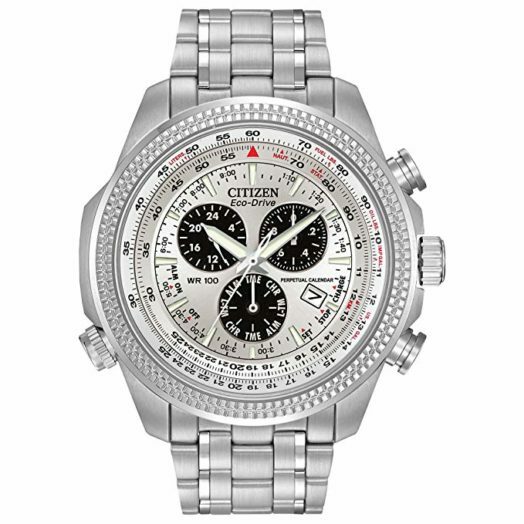 Citizen Eco-Drive Perpetual Calendar, Chronograph Watch exudes class. At a quick glance, it really catches the eye. Because the dial is a light color it draws attention and paired with the silver of the stainless steel casing will always attract a second glance. The dial may look busy but for those who like busy, it simply adds to the appeal. The chronology of this particular watch may contribute to the busyness. Having three dials to register time elapsed, one each for the hour, minutes and seconds. For anyone who has a watch, they have put away because it requires a new battery and simply hasn't had time to replace it. This watch is eco-driven hence needs only exposure to light to keep it charged. No batteries, no hassles, and no extra expense. The Citizen Eco-Drive watch also has a perpetual calendar. The perpetual calendar mechanism of a watch allows the date to change according to the calendar year. Taking into consideration the differing lengths of months and leap days, and continues for years. Never have to adjust the date again definitely an added bonus. A watch that gives its owner plenty of bang for their buck and won't disappoint. Citizen has designed a watch which offers practicality, sophistication, and affordability and is comparable to any watch in this category. The company was first founded in 1930 by both Swiss and Japanese investors who are arguably two of the worlds most advanced watch technology countries. Citizen is the parent organization of the American watch company, Bulova, one of the oldest running watch companies in the world. Citizen is a company renowned throughout the world and has always maintained a respected name in the watch community. It has consistently created reliable, durable, dependable, visually aesthetic time-pieces backed up by the latest watch technology. Citizen Watch Co offers a wide range of watches at prices affordable to every individual no matter their style. If you have never owned a citizen watch this particular watch is a great addition to any wardrobe, and with proper care would last a lifetime. Your favorite Star Wars characters on your feet. This brace helps you effortlessly improve your posture. This sensor/app technology puts a running coach in your pocket. Calm your troubled mind with the Muse brainwave sensing headband. An inflatable pillow is built-in to the hood allowing you to rest on the go. Wearable compression silicone taping system. Hearing protection designed for use at concerts and festivals. The Spire Stone stress management device recommended by medical experts. Lumo Lift is the worlds first digital posture coach. FeedSummit is a curated catalog of ideas that improve the lives of those that use them. We add new products, services, crowdfunding campaigns, and apps to the catalog daily. Enter your email to receive FeedSummit updates delivered to your inbox.